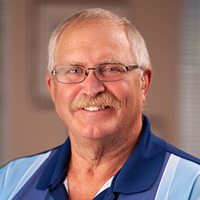 Duane’s commitment to excellence, his innate knack for problem-solving and outstanding people skills were all factors in PeopleService’s decision to make him Nebraska Region Manager in 1998. Duane is honest, forthright and committed to the people he works with as if they were family. “I consider myself lucky. I know Nebraska. My family is here. My friends are here. I understand what the people are about – and this job is all about people. I work with a great team of professionals. People I truly respect. Knowing that we all share the same goal of putting the needs of the people we serve first makes my job a very rewarding one.” Happily married for 42 years, Duane and his wife have two daughters and three grandchildren. Duane enjoys fishing and bowling, but his great passion is golfing.